Ever wanted to come to Japan and get some of the powder you have been hearing so much about? 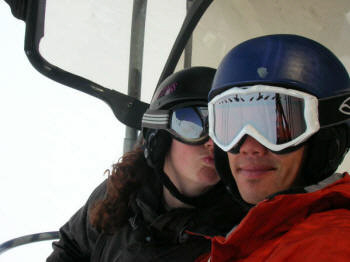 Done a great deal of skiing/boarding overseas and perhaps met some Japanese folk doing the same? Have a significant other that also wants to come to Japan but worried you may not be able to find work/accommodation together? If you answered yes to any of the above, you are not alone. an interview of the international couple mentioned at the beginning of the volume. “I think everyone has moments when you could sell ‘em on wintersports. During our conversation that day, the co-worker starts speaking about English communication & how it has become important, both for performing his duties given all the International guests as well as communicating with seasonal foreign workers. He spoke in particular about one snowboarder from New Zealand that worked at the resort this season, and how it was very enjoyable to communicate about boarding and the like with him. With the family theme from the Sam magazine article above, it was at this point that everything fell into place. Here were two guys from very separate upbringings brought together into one big happy family, despite their lack of a common language. A scene repeated winter after winter at snow resorts all over the world. How did this come about? Arai has just finished the fourth consecutive white season of employing seasonal foreign workers via the working holiday visa program. Although the first such employee via this channel had a tough time of things, gradually a system within the resort has fallen into place to enable additional hiring of such staff. 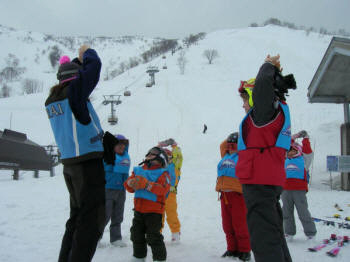 For white season 2005-’06, six such staff members were hired to work in the ski school at the resort. While there is always room for more of such potential employees during the winter, the ones that make it through and actually work here end up making a real contribution to smooth operations (and most often enjoying themselves in the process). With similar employees the above process has taken only one month, but for others it stretched out to almost half a year. Regardless, it requires time and resources from all parties involved. So is it worth it? Read on and see for yourself. Can tell us a bit about your background? What position do you have at Arai? How did you get to that position? Did you have any responses from other resorts in Japan? Both of us applied to Tour Operators based in Niseko, Hokkaido that offered English-speaking tours. The responses we got were that although positions were already filled, if we made it up there both of us should pop in to the local offices. 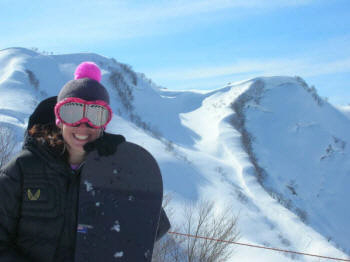 Natalie applied to a few hotel resorts in and around Niseko that offered childcare, which were also found on Snow Japan. When we went to the related site link for these places and forwarded an e-mail asking about work for foreigners, their response was, “Can you speak Japanese?” Given that our level of the language was minimal at the time, employment with these places was out of the question. We turned back to Snow Japan & wound up doing searches for resorts by prefectures, & that was when we stumbled across Arai. This time however the associated link led us to an English site for the resort that our browser could handle & voila, we had found our winter destination. Compared with our initial experiences above, it was relatively easy to get in touch with Arai to arrange employment. What kind of qualifications do you bring to the job? Seven years in the ski/tourism industry working at many international resorts as a qualified snowboard instructor, outdoor event coordinator & terrain park manager. Three seasons within on-mountain childcare environments, backed by qualifications both as a qualified primary school teacher and early childhood educator. What does your job involve (the whole wide picture)? And on a day-to-day basis? My job involves teaching mainly English-speaking children up to and including level 3. 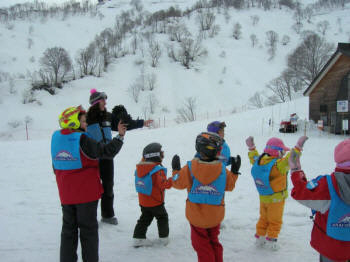 My main role is working as a guide in the Kids Adventure Program, where children learn to or continue learning mainly skiing in a group environment. The design of the lessons is such that skiing and having fun in the snow is strongly emphasized. That is, kids have wonderful enthusiasm and simply want to ski and then ski some more. The goal is that each child should finish the program and feel good about what they have accomplished, regardless of what step they eventually reached. I start my day in the salon of the Guide Center at 8:30 greeting and registering guests. The full day program includes a "kids lunch" which the kids eat together with their coach. The kids are fully attended to until 3:30 pm when the course finishes. At the end of the day following ski time I once again greet parents and we discuss their child’s progress. As you can see, although the generic job description is ski guide, we’re actually responsible for quite a bit more. Are you a skier/snowboarder? And for how long? Do you get to ski much now? I’m a Snowboarder and have been riding since ‘98. Fortunately I get to ride Mt. Ohgenashi at Arai quite a bit! Given that my work falls on school holidays/weekends, I’m free to board with my complimentary seasons pass during the weekdays when the slopes are empty! Skiing for me began at the age of four - I would ski in-between my Dad’s legs and then zoom off down the piste! Skiing dominated until my mid teens when I wasn’t able to get to the slopes so much. As an adult I developed an interest in snowboarding and have been participating in this sport for about 3 seasons now. Do I get to ride now? You betcha! When the resort is not busy I can’t get enough of the Japanese powder - perhaps one of the best kept secrets amongst riders in the know. I have had many epic turns this season, a lot to report home to family & friends about. Have you managed to visit any other snow resorts during your stay in Japan? Got a chance to check out a few resorts in the Myoko-Kogen area as well as Yuzawa & Iiyama. The terrain parks and half pipes were well developed, but the on mountain terrain was less enjoyable than Arai. We were stoked to be able to travel and experience other resorts in Japan, even if it was mostly just Niigata Prefecture. If we stick around for next winter, Hokkaido and Nagano will be on the list. With the sheer amount of snow that falls, we think Arai is the best because of the conditional zones and general steepness of the resort. We did not partake in any off-piste riding, so no comment on that area. What do you think of the quality and quantity of Snow in Japan? 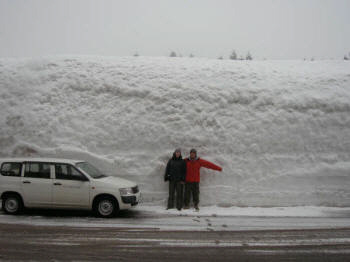 Japan excels in both quality and quantity of snow when compared to New Zealand. The past couple of winters in NZ have definitely been a MISS, with less snow falling each year. NZ has epic steeps and favorable terrain, but it is no fun sliding on ice and rocks! There are so many resorts in Japan. How does ARAI try to set itself apart from other resorts? Is it difficult to do that? Arai caters to the higher end of the International market, and so offers many exclusive activities such as esthetic treatments and snowmobile night tours. Although I don’t know for sure, my guess is that there are not many other resorts that offer such services in English. I think Arai provides guests with a well-rounded vacation. Not only does it have great snow, but guests can also relax at a beautiful spa, or hibernate in their rooms. Parents know their kids will be well looked after (you should see the indoor kids playground! ), so it is essentially a hassle free holiday. 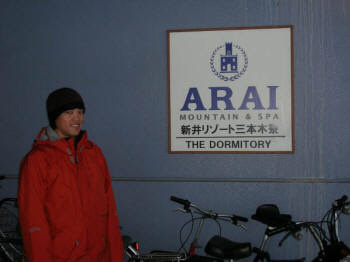 Does Arai see itself primarily as a ski resort, or a hotel resort… and how does it go about marketing the resort? Although it is a relatively new resort, I understand that the first of the three resort hotels opened in 1993 (the same year as the first of the slopes on the mountain), so in that respect it is still early times as far as defining itself. I think Arai is both a ski and hotel resort - for some the main feature is the mountain but for others it is the resort hotels and their amenities. It has been designed so that the guest can choose how they primarily see the resort. Perhaps this is one of the reasons why the International community has been drawn to the place? What was your lifestyle like as a foreign couple working and living at a Japanese resort? We lived in the Arai staff dormitory, Sanbongi, & were given a private room to share that included a bathroom. The kitchen is communal which worked well as it gave us a chance to mingle with Japanese co-workers. Everyone was easy going and very helpful at all times, which made the initial transition quite smooth for us (important given our arrival from overseas just days earlier). The Japanese staff with English skills did approach us more, that is understandable as they are more confident to be able to get their point across. But we had good times with all staff, and it definitely made it an enjoyable winter. How do you see the Japanese winter sports industry going in the next 5 or 10 years and beyond? 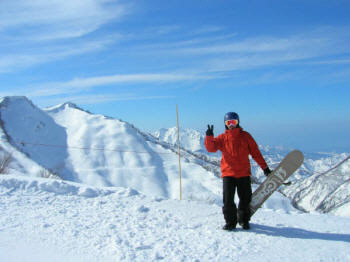 Japan has a lot to offer the skiers and snowboarders of the world! The snow here needs to be seen to be believed, and the world is not yet aware of this fact. Perhaps the next 5 years will see a travel boost to the region, but at the same time it is such a nicely hidden secret! Freestyle is something that can be expanded here as many skiers/boarders are looking precisely for that. Do you have anything else that you wish to share with Snow Japan readers? Niigata Prefecture needs to be visited at least once in your boarding life! Arai I understand is one of the more advanced mountains in the area, & is a great place to get both freshies as well as a true Japanese experience. I’ve ridden many other ski resorts in several countries but have never seen sooo much snow fall from the sky as I have here in Japan. 5-meter base, need I say more? It is obviously not for everyone, but definitely an experience for those that are up for it. Somebody famous once said “ You are the sum of your life’s experiences”. If you like powder, Japan should be one such experience of your life at some point. This volume of the setting journals is dedicated to both seasonal foreign workers & guests (who made their employment possible) that have graced the resort to date. Together, everyone has done their bit to keep Arai one big happy family.